One of the things I love about Raw Till 4 is the simplicity of eating. Yes, you have to eat a lot of calories, and it can be a challenge to eat all you should each day. It’s a challenge physically, to cram that much food into your stomach. And, it’s a challenge mentally, as it goes against everything you’ve done in the past, in terms of restricting calories to lose weight. So here another raw till 4 recipe that is cheap, high in calories, quick and easy to make, and tastes amazingly sweet. 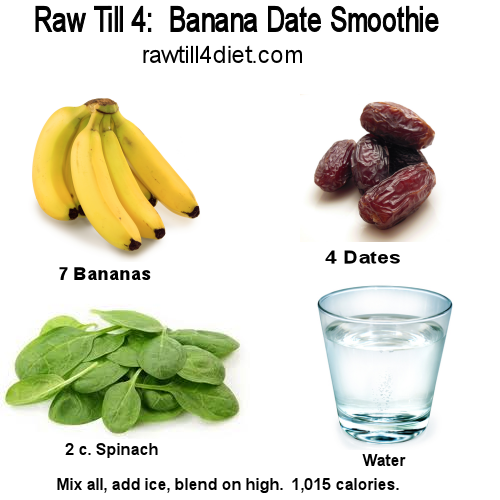 The easiest way to get enough calories on the Raw Till 4 diet plan is to eat alot of bananas and dates. And the easiest way to eat bananas and dates is to blend them with ice and water to make a delicious banana milkshake. At it’s most basic, all you need is 7 bananas, 4 dates, enough water to make it drinkable, and some optional ice to make it cold, and easier to enjoy. Mix all that in a high powered blender, I use a Vitamix 5200 with 64 oz jar, and bam, you have a 1000 calorie raw till 4 approved meal in less than 2 minutes! I’m a big believer in getting your greens into as many meals as possible, so I also would throw in 2 cups of organic baby spinach to this smoothie. It only adds 14 calories to the meal, but adds lots of rawsome vitamins, and even 2 grams of protein. There you have it, a 1000 calorie meal that costs about $2.00, takes less than 2 minutes to prepare, and tastes GREAT! Now, you have no excuses when it comes to getting enough calories following the Raw Till 4 program. 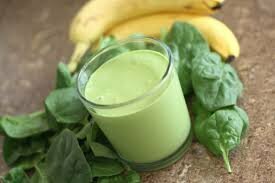 Here’s a handy recipe card for my favorite banana date spinach milkshake. I too did Body For Life, (as well as many other diets), and I can see your exposure to the book shows in your super convenient ‘recipes with the exact ingredients in color pictures’ you’ve put on here (Bill Phillips does that in his books, probably my favorite thing about him- makes it really easy). Can you please post more of these!!! I have benefited greatly from them because I am a visual person. I’m sure there are many others out there who are the same. Thank you! Thanks for the encouragement Tiffani!! I have been very lax in posting here the past few months due to work, moving, and a very sick spouse. I will endeavor to post some more of these. I’m fairly new to this whole RawTill4 concept. Been having stomach-issues for a very long time, and I’m “only” 23. This smoothie seems rather big to me, how quick should it be consumed? 5, 10, 15, 30 minutes? I’m hoping to learn more and become healthier soon. Hi Chris, welcome! The smoothies can be daunting for the beginner. I sip mine through a straw, and generally finish it over half an hour. The bananas on the picture are green. Always use ripe bananas. You are correct. On both accounts. How much water and ice? Also does 2.c mean 2 cups?